Recently I found myself on the receiving end of a reminder that looks can be deceiving, and that it’s not smart to judge a book (or in this case, a video game) by its cover. In that game’s case, its promising looks ultimately covered up what turned out to be a flawed interior. 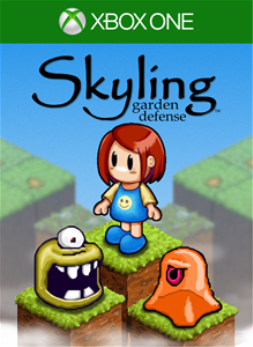 With Skyling: Garden Defense, however, it’s quite the opposite, but in a different sort of way. Its pleasant aesthetic covers up the fact that it’s much more challenging than what a first glance could possibly tell you. 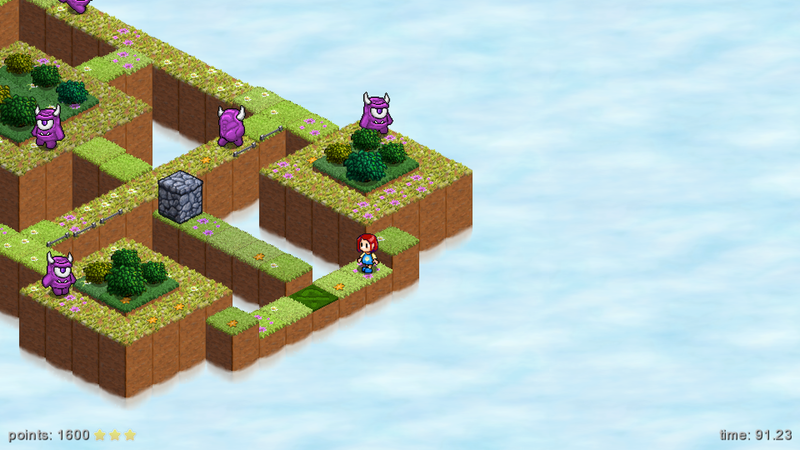 Skyling: Garden Defense is an isometric puzzle game that’s all about strategy and outsmarting the enemy. In small gardens up above the clouds, a variety of Blight monsters have destroyed what was once lush, green plots of land, decaying it to dry and barren soil. A Skyling girl named Bloom has the power to restore these plots to their former beauty by simply walking over each one. The written narrative and direction is told through a series of rhymes that meshes together with the other elements to create a bright and innocent atmosphere. 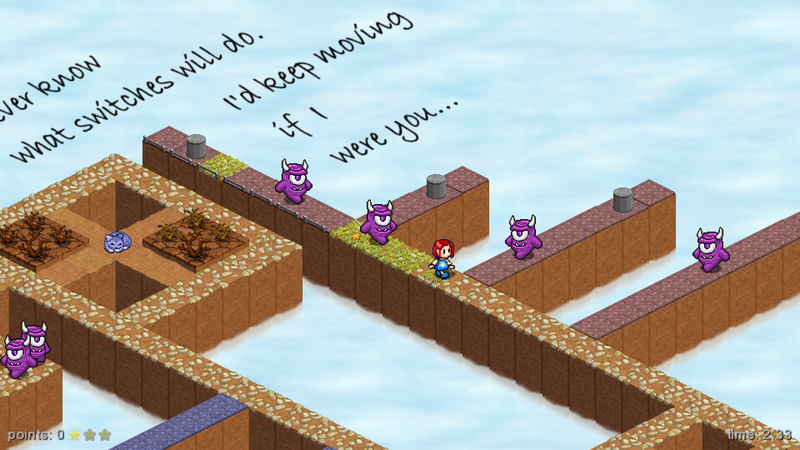 On the subject of deceptive appearances, Skyling sets itself up to appear like it’ll be a breeze to pass through. While earlier levels start off with a linear progression, the path eventually begins to branch off into a maze of crisscrossing directions. Bloom’s objective is to restore nature to every square and make it to the level’s endpoint without being caught by any of the monsters. This is relatively simplistic when starting out, but more paths, elevations, and monsters eventually require a more strategical approach. Bloom is almost always vastly outnumbered, and with very limited attack options available, observing movements and behaviors is always the key to solving a level. In certain situations, the controls are not as tight and responsive as they should be. When trying to navigate in-between monsters swarming in from multiple angles, it was frustrating to sometimes continue moving forward into danger when I had been trying to quickly change directions. This was not a major recurring issue throughout the game, but it was an occasional one nonetheless. Each of Skyling’s monsters have specific strengths and weaknesses to take into account when planning out the best path forward. 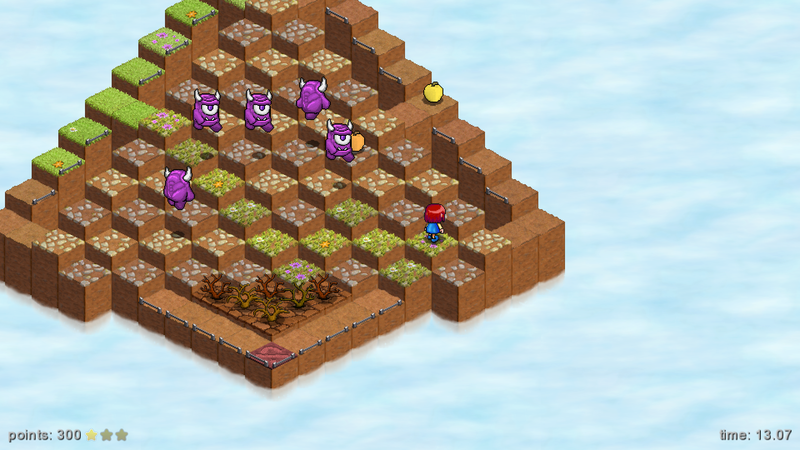 While Ogres are limited to moving on squares with rocks, they also have the ability to jump to different elevations. Slimes will destroy the blocks that you’ve replanted, but can also be picked up and used as a weapon against other monsters. Throwing these Slimes can be frustrating as it’s sometimes hard to gauge where the attack will hit. They can only be used to kill certain types of monsters as well, so it can often feel meaningless, especially since that’s the sole form of attacking. Bloom’s only allies are sleeping cats that can be picked up and set down to strategically block off certain portions of the level from advancing monsters. Don’t worry though, no felines appeared to be harmed along the way. Aside from the goal of replanting each garden and proceeding onto the next one, side objectives such as obtaining three stars and completing the level as fast as possible are also present. The three stars are scored based on points gained through picking up bonus fruit, killing enemies, and a time bonus. Other than for a completionist sake, however, the presence of these stars feels fairly meaningless. They are not necessary to unlock later levels, nor are they necessary for any of the game’s Achievements. The same can be said for the completion times of each level. Skyling seems like a game that could appeal to the speedrunning community, but strangely, it doesn’t save your actual best times for each level. No matter how many different ways I tried, the recorded times would always revert back to whatever was set by default. The absence of a leaderboard also removes any chance of turning each level into a competition with other players. Similar to the unlockable stars, it’s hard to discern an actual point to its presence. Neither of these features seem to really give or take anything from the game. They just exist. Completionists will be happy to know that Skyling's Achievement list is fairly simple to complete. There's an achievement tied to watching the story's very short prologue and eight that are awarded simply for playing through all of the levels and finishing the game. The Triple Kill and Quad Kill Achievements are both tied to killing multiple enemies at once. The best Achievement of the bunch, though, is Cat Hat!, which is unlocked for bringing 25 of your feline friends to the endpoint with you. The reviewer spent seven hours returning nature to the gardens above the clouds. All 13 of the game's achievements were unlocked in the meantime. A copy of the game was provided by the publisher for the purpose of this review.